Whiz kids 8x8 Paper Pack, Bunting, Decoupage Pad, Clear Stamp Footballer Set, Sentiment Toppers. 1.Begin by cutting out your template and drawing around it onto a piece of A4 Dovecraft white card. Begin scoring along the lines as indicated on your template. TIP: If your printer takes card, print the template directly onto a sheet of card to save time. Once done, cut out and score. 2.Cut 4, 6x 12.5cm pieces from your Whiz Kids 8x8 paper pack and adhere them with glue on the larger sections on your box. 3.Flip your template over horizontally and adhere 1, 7.5cm x 6.5cm piece of green Whiz Kids paper to the smallest flap on the right hand side, this will be the back of your card. Next cut 3 patterned, 7.5cm x 6.5cm pieces of paper and glue them to the other flaps. 4.Use the same green paper that you used for the back flap and cut another 6x12.5cm piece and adhere this underneath with glue. Put your box together and secure with Dovecraft Perma Fix tape. Ensure to have the large paper panels facing the outside when you put your box together. 5.Next, cut two 2cm x 9cm piece of Dovecraft white card, score 1cm in at each end. Once ready, stick them to the inside of your box, one in front of the other, with Dovecraft Perma Fix tape. 6.Put together the goal scene from the Whiz Kids decoupage pad and stick it to the inside of your box, at the back. 7.Next cut 2, 7cm x 3cm pieces of Whiz Kids green paper and create a fringe effect along one side on both pieces to create the look of grass. Adhere these pieces to the thin strips of cardstock in your box with Dovecraft Perma Fix tape, ensuring to have the fringed edge facing up. 8.Stamp the Whiz Kids clear stamp ‘So Cool’ sentiment onto a piece of green paper. Cut out, adhere to a thin strip of Dovecraft Acetate and stick it to the inside of the box, at the front. 9.Die cut the football from the First Edition Sports die set onto a piece of white and black First Edition Textured card stock. Punch out the holes in the white diecut and then adhere to the black card. Add your football to the end of a thin Dovecraft Acetate strip. Take the ‘Goal!’ sentiment from the decoupage pad and add this to the top of the acetate strip, once ready stick this to the back of the strip of grass at the front of your card. 10.Put together another Whiz Kids footballer decoupage character and football on two separate strips of acetate. Add these to the back of the grass strip toward the back of your card. 11.Stick the ‘Birthday Boy’ sentiment to the back of your box card, at the top. 12.Take three Whiz Kids bunting triangles and line them up together on the front flap with 3D foam squares. Die cut the word SON from the First Edition Male Family Sentiment die set onto your chosen Whiz Kids 8x8 paper sheet and adhere it with 3D foam pads to the bottom of the front flap. Create a pretty, pink birthday card for the little princesses in your life with the Whiz Kids collection! Adorned with a twirling, glittering ballerina, this card uses lots of embellishments to really make your craft sparkle. Maxine has used a clear stamp sentiment, adhesive gems, the decoupage pad and a miniature bow in her make. Find out how to create this shape following our card shape of the month tutorial here! Want to add a little sea time adventure to your children’s’ birthday cards? 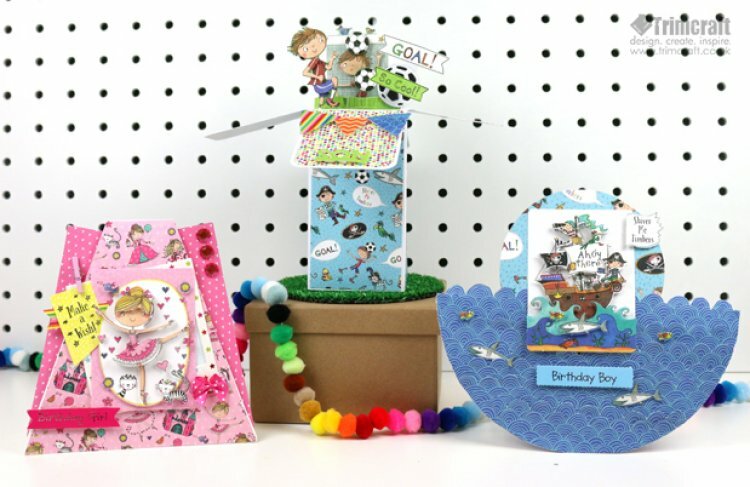 Using the different decoupage scenes in the Whiz Kids collection, you can layer up your own pirates’ boat and use the matching paper to make some 3D waves. Add some glittering sharks for a touch of excitement and if you leave the bottom of the card rounded it will rock like it’s really at sea! Has this tutorial inspired to get crafty for the kids in your life? Remember to upload your makes to the inspiration area and #trimcraft on your social media posts to let us know what fabulous crafts you have made!